We need to clarify this point. My understanding is that NASA Eagleworks calls "thrust" the force occurring in the same direction as the acceleration. I am aware that Roger Shawyer has written that the thrust force and the displacement in his measurements occur in different directions, and that the EM Drive must be already in motion (or something to that effect), but frankly what he wrote in this regard is not comprehensible to me (and from what I recall was not comprehensible to @frobnicat either). Apparently it was not comprehensible to other people either, as his latest report http://www.emdrive.com/EmDriveForceMeasurement.pdf addresses this (I find his latest report just as difficult to reconcile). In the chart below, he even refers to a "force direction" which can be in the same direction as what he calls "thust" or what he calls "reaction" occurring in the opposite direction to what he calls "thrust". 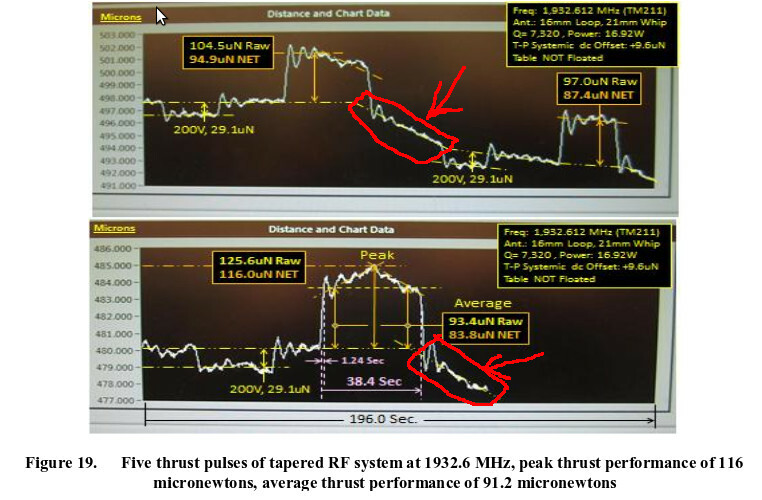 "How do we interpret the "RF Dissipated Power" in the central caption of this slide ? Is it the (DC) power input to RF amplifier ? Or the difference of RF power input to frustum minus reflected power back to amplifier ? " Simple, it's the forward RF power being dissipated in the RF load AKA resonant cavity, minus the reflected power being dissipated back in the RF amplifier's 50 ohm isolator load. We measure it with two Mini-Circuit -50dBm to +20dBm RF power modules attached to the forward and reflected ports on a -40dB down bidirectional coupler. "What is horizontal scale, is the != 0 part 16.5s long like the power-on period of the thrust chart ? The LabView RF power meter graphics has a scrolling data logging output with time on the horizontal x-axis and RF power level on the y-axis. Since a full frame of the time axis takes about 3.5 minutes to scroll from right to left, there are no time units appended. We are all very eager to have fresh data and it may be contradicting the need to detail all parameters and legend every possible axis, given the time it takes for crystal clear communication. I'm still struggling to fit the time axis of the power meter chart with the thrust chart. If its 210s from left unit 146030 to right unit 146229 (actually 1s per unit ?) it would make the whole power-on run a minute long or so, from the power meter chart. Can you confirm the time mapping is correct as shown overlaid in red in attached picture below ? "Why this particular profile with initial spike and 2 plateaus ?" Because I was manually controlling the VCO frequency to maintain the minimum VSWR, which at times is a bit jerky, being that my control servo loops are not as good as they used to be. "Why don't we see a corresponding 3x magnitude "step" on the thrust chart at half the excitation time ?" Overcoming the Inertia of the torque pendulum load which is close to 10 kg. Thing is, the pendulum arm with its 10kg is usually not that shy of steep responses (on µm scale) from steep excitations, typically below 3s time constant. So this is strange that we don't see a corresponding step in thrust to the step from plateau to plateau of power (each during almost 8s). Why change of excitation power would deserve more "inertial smoothing" than on/off power steps ? Or that what counts is not the net dissipated power in frustum (forward minus bounced back) but only forward power (regardless of what is bounced back). How could that be ? So, we'll have our article on the EM Drive - expertly and patiently built by Dr. Rodal and subedited by my assistant editor Chris Gebhardt - published on Wednesday. We'll link in this thread and also have a standalone thread (the latter allowing people to get up to speed - an entry level thread as such, before braving this 104 page, 470,000 viewed thread). I've been following this thread the best I can and I have to say that while I'm proud I know my way around a RS-25 engine, this thread has proven I probably didn't pay as much attention in class as I should have! The encouraging thing is, while NASA has become somewhat "social media fluffy" and has lost a lot some of its focus of late, there's obviously less publicized areas, such as Eagleworks, that are the true essence of Bruce Willis' line in Armageddon, where he claims "You're NASA, you're geniuses. I bet you've got a room of people just thinking *stuff* up, and people backing them up!" It was soon apparent, when we started to write this article, that the amount of work done by different people in this thread was so immense that it was not possible to discuss it in the article and to do justice to their work. So, unfortunately, there was not enough space to deal for example with the voluminous literature uncovered by @Mulletron, or to properly discuss the force equation, dependent on mode shape, derived by @NotSoSureOfIt, or to properly discuss the numerical simulations using MEEP by @aero, or the exact solutions I obtained. Nor was there space in the article to discuss the experimental program independently being pursued by @Mulletron, or the excellent engineering discussions by @frobnicat and @zen-in of the EM Drive measurements as an experimental artifact, or my paper discussing thermal buckling, or countless other important contributions. In order to attempt to make the paper comprehensible to a wider audience we needed to focus on the work at NASA Eagleworks with only a succinct reference to the work in the UK and China. 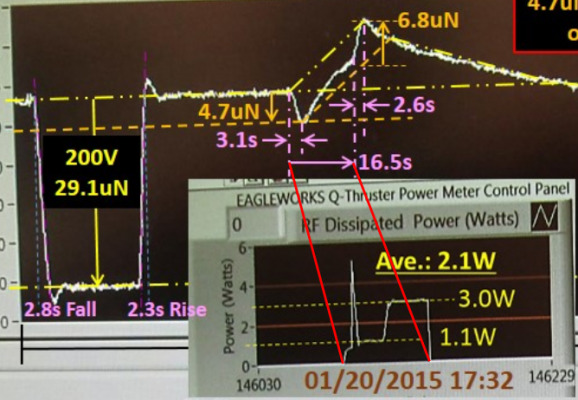 The emphasis was to try to write an objective review of NASA Eagleworks research. I want to thank everybody that helped in the article, to Chris Bergin for a huge amount of patient work in editing the paper to make it comprehensible to a wider audience, to @Mulletron for starting the ball rolling with an excellent draft, to @sghill for always being helpful and for motivating us to continue, until the end, to tell the story, and to @Rotosequence and @D_Dom for their always cheerful and helpful editing. To them goes any credit, and any criticism for the paper falls on my shoulders. What I was referring to is how in most of your graphs, after you turn your test article off, the graph shows a rising force acting in the opposite direction to the force you got when the device was turned on. If the RF on time is the same as the duration of the thrust waveform there should be a second step response in the thrust waveform. No one expects the response to be linear but it should be consistent. Where might one find the plans for the em-drive and the experiment to replicate the experiment? You are referring to a drifting baseline for the measured displacement. It is addressed (succintly) in the "Anomalous..." report text in reference to thermal effects, and in multiple posts of @Star-Drive, @frobnicat and @zen-in in the EM Drive threads 1 and 2.
and well, IGN has posted a video and an article, linking to this forum... and claiming NASA is one step closer to a warp drive and that Paul March has found that some of the laser beams fired inside the EM Drive Chamber were travelling faster than light. what I wonder is how this big public awareness may influence NASA... pressure to keep funding EM/Warp, or pressure from conservatives (scientifically) that dismiss propellantless drives and FTL as nonsense without even looking at the data, for NASA to cut the funds to Eagleworks? When a mirror reflects light, it experiences a slight push. This radiation pressure can be increased considerably with the help of a small superconducting island. This was revealed by the joint research done in the Aalto University and the Universities of Jyväskylä and Oulu. The finding paves a way for the studies of mechanical oscillations at the level of a single photon, the quantum of light. The results of the research were published in Nature Communications in April. Coupling electromagnetic waves in a cavity and mechanical vibrations via the radiation pressure of photons is a promising platform for investigations of quantum–mechanical properties of motion. A drawback is that the effect of one photon tends to be tiny, and hence one of the pressing challenges is to substantially increase the interaction strength. A novel scenario is to introduce into the setup a quantum two-level system (qubit), which, besides strengthening the coupling, allows for rich physics via strongly enhanced nonlinearities. Here we present a design of cavity optomechanics in the microwave frequency regime involving a Josephson junction qubit. We demonstrate boosting of the radiation–pressure interaction by six orders of magnitude, allowing to approach the strong coupling regime. We observe nonlinear phenomena at single-photon energies, such as an enhanced damping attributed to the qubit. This work opens up nonlinear cavity optomechanics as a plausible tool for the study of quantum properties of motion. In summary, non-linear behaviors of the quantum system in a microwave transmitter driven, superconducting resonating cavity is increasing the mechanical effect of radiation pressure by four to six orders of magnitude. We found that this slope change after the test article and RF amplifer were turned on for 10-to-20 seconds was apprently due to IR radiation from the amplifier's heatsink that is mounted on the back side of the torque penlulum on an 8" square platform was affecting the top C-flex bearing more than the lower one. We tried aluminum shielding the top bearing assembly from the heatsink IR source and managed to reverse the metioned thermal slope in the thrust plots, but after shielding the bottom one we could reduce it but still coundn't completely get rid of this thremal drift artifact. Currently we are just living with it. Then later in present thread, after reporting (as seen on later pictures of setup) some mitigation of the problem (IR insulation) Paul March made mention (don't have the link at hand) of heating of same flexure bearings by return currents from pendulum arm (rotating assembly) to ground (fixed assembly). with lambda still to be determined (because inconsistencies in reported parameters/results makes it a 1 order of magnitude unknown). The absence of second order derivative wrt time of CoMs position influence makes possible for a slowly moving CoM to induce a sustained (and even increasing) vertical measure on charts. I have not heard back of my remark that, given the inclination of axis toward the rear part of the experiment (as seen from front of vacuum chamber) and the position of rotating assembly's CoM behind the axis, the orientation of said influence is contrary to what appears on the published slides when considering only recoil effects : a displacement to the left of some part of the test article (relative to fixation on pendulum arm) would induce a corresponding proportional shift in position to the left of pendulum arms front part (where displacement is measured). This is of course only valid within the given information (tilted toward back + rotating assembly CoM behind axis) collected so far. More problematic than those long lasting slow drifts in rest position after power on/off, is the fact that there seem to exist a continuum of situations in between slowly evolving charts (in response to excitation steps) and steep responses that serve as proof of real thrusts on the argument of their steepness (sorry for the poor wording). For instance, the rise and decay of the chart below (obtained in vacuum) show a very different time constant to reach and leave the "thrust" plateau than with the electrostatic calibration pulses with their clean square force(t) profile. The smoothed rise could be explained by change of tuning (effective received power) of the cavity, needing a "warm-up". But the smoothed decay is really a showdown. Off is off, there is no "warm-down" time to speak of for EM radiation to disappear (on the order of µs, given size and Q factor), and no electromagnetic/quantum theory could explain such a delay unless the vacuum is as heavy and viscous as oil or water. This lag in the decay, most visible in this particular chart, was already noticed by other contributors (sorry, can't remember). Well, I have to admit I was being rather cheeky. To me, this "drift" (which did still exist in the vacuum) is a definite indication that there are experimental errors that are larger than the measured force. This is what typical real world null results look like: they do not look like a literal zero, they look like a force which, no matter what you do, is of the same order of magnitude as other experimental errors. Sawyer and the Chinese do worse experiments, they have larger forces; you do better experiments and you have smaller forces; if you generate enough buzz and manage to annoy a modern experimental physicist remotely approaching Cavendish calibre to try to replicate it, he'll, no doubt, measure fractions of a micronewton. As such the experiment lacks the most critical part: ability to distinguish between forces arising from the known physics, and some novel physics. edit: for the sake of clarity, you is the general you not you personally, of course. Nice find, I think this one is utterly damning for any hope that the experimental set up is working correctly. Keep in mind by the way that the time constant for a small thermal mass sinking into a large thermal mass can be similar to the time constant of the "drive", and would at one explain both the slow drift and the fast drift. What bothers me the most about this research is that there is a perfectly simple and rather cheap way to screen out most of such effects. The test article needs to be powered off a battery, run from a timer, and be enclosed in a conductive box with permalloy shielding; hanging off a very very Cavendish style torsion pendulum (which is fairly insensitive to shifts in CoM as well, by the way). The vacuum, stiff springs, damping assembly and electrostatic calibration, you can get by without any of those things. You could shine a laser off a little mirror to measure the acceleration directly, and even let the apparatus integrate the momentum for you. But a box that shields the apparatus from the test article, you can't do without! This is of paramount importance. What ever manual frequency tweaking they do could be done with a few dozen lines of code in a microcontroller. Well, I have to admit I was being rather cheeky. I think you need to clarify who you are, if you're aiming to join this thread 104 pages in with your insight. Others have provided qualifications to their comments, it would be less "cheeky" if you did likewise. Perhaps @Star-Drive may be willing to comment further on these issues regarding the experiments at NASA Eagleworks. I suggest a "required reading" link for new visitors. Problem is: it would probably be 100+ pages long, though. More if we take the other thread into account. Well, one shouldn't even see a drift the size of the measured force, when it's not even sub-micronewton range. If one is heating metal, one is probably heating it unevenly, and it bends as long as heat is applied (the hotter material expands more), with a fairly short time constant (because the temperatures will equalize quickly once the heat source is off). Then the heat gets slowly conducted to another structural element, and that structural element happens to bend in a way that influences the experiment in the other direction. How much each structural element will bend will depend to how tight the screws are tightened, what stresses are already in the metal, and so on and so forth; it's essentially impossible to account for. Heat transfer, thermal expansion, thermal stress analysis for uncoupled and for coupled problems, in static and dynamic problems of complicated geometry and materials can be analyzed and modeled with Finite Element analysis (NASTRAN, ANSYS, ABAQUS, ADINA, COMSOL, etc. ), just like rockets, spacecrafts and military and commercial aircraft have been analyzed for decades. The issue for analyzing thermal structural effects (and other effects) for the EM Drive project at NASA Eagleworks is not a matter of present ability to be analyzed but is, instead, a matter of scarcity of project resources (money, time, and personnel) to analyze them. For example, NASA's EM Drive truncated cone was made by Paul March himself in Paul March's wife dining room. NO TAXPAYER's tax $$$ involved in its construction. Engineers and scientists interested in this project, (like @frobnicat, @notsosureofit, @aero, myself, etc.) have contributed their time as well to model different aspects of this experiment to try to distinguish any artifacts from real effects. Earlier on I contributed results of a fully-coupled nonlinear analysis of the torque pendulum used in the experiment, as well as Autocorrelation, and Power Spectral Density analysis of the data. Concerning the issue of shielding, @aero has contributed a MEEP analysis of evanescent waves leaking from the EM Drive, and possibly interacting with the stainless steeel vacuum chamber. Subsequently, Paul March conducted an experiment with the EM Drive outside the stainless steel chamber that may have nullified that explanation. @Mulletron has contributed his own resources and time to run his own EM Drive experiment from a hanging torsional pendulum. Paul March has contributed detailed information about the experimental set-up, and if you are interested, you can also contribute any engineering, preferably quantitative, theoretical, numerical or experimental analysis you may be able to contribute. This may seem dumb, but why not set up a Kickstarter for this? Whole lot dumber items have gotten funded this way, so I think that helping to fund the development of the EM drive, ESPECIALLY if it proves to help further physics knowledge, would likely go over quite well. When you go to do this, make sure you keep it in layman's terms when you explain what the funding is for. I think a LOT of people would be happy to have their names attached to this if it actually proves to be a usable drive of some sort! If not, well, we just proved another way that the EM drive didn't work, doesn't mean that it can't work though. Pretty much because of the rules for how the NASA Eagleworks team must work prevents it. They cannot accept donations of money, time, or resources. Any services provided by a company must be an equal value exchange. So, we cannot make a company, buy them a million dollar research device, and sell it to them for $1 or let them use it for anything less than competitive rates for a similar device. Now you COULD try to set this up for a personal project rather than helping the Eagleworks team directly. But of course, you'd better have a decent proposal and such written up.